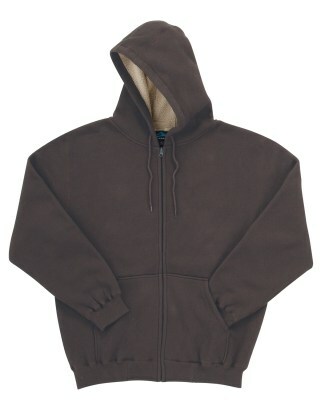 60% cotton/40% polyester thermal full zip hooded sweatshirt with a heavyweight bonded 7.4 oz. anti-pilling khaki sherpa fleece lining. Features rib knit cuffs and waistband, and drawstrings at the hood. Brass zipper and front pouch pockets.